Apple could be planning on producing a MacBook which consists of two displays, replacing the traditional notebook base with a second OLED screen that can function as a keyboard in the same vein as the Touch Bar. This is according to a patent (spotted by Patently Apple), and it would mean in effect that you’d have a traditional MacBook with a virtual OLED keyboard – although this is not the only implementation the document discusses. 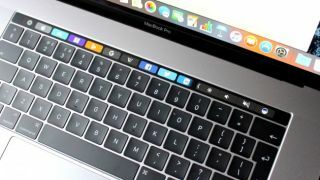 Such a secondary OLED display would give the MacBook obvious benefits in terms of flexibility, because while it could act as a traditional keyboard, it could also become, say, a sketch pad, or it could display the full custom controls for a game. In short, it’d be possible to pull off all sorts of neat tricks in that respect. Apple also mentions using ‘polarizer layers’ to help reduce any possible reflections of the light of one screen on the other, and which may also allow the user to view the screens outdoors while wearing sunglasses. The patent mentions not just a MacBook use case, but also the possibility of having a detachable 2-in-1 built like this, which might indicate that Apple could be considering pairing up this invention with the iPad rather than its notebooks. As ever, this is just a patent, and its existence doesn’t necessarily mean anything for either MacBooks or iPads; ultimately, the concept may never leave the development and testing labs. If it does come to fruition as a MacBook, it’s likely not just going to have ‘polarizer layers’, but also a polarizing effect – there are certainly those who dislike the Touch Bar, and they’re unlikely to welcome the expansion of the concept to a full virtual keyboard. There may be doubts about exactly how effective such a virtual peripheral can be compared to the typing action of a physical keyboard. Although Lenovo has already done something similar with its Yoga Book convertible complete with virtual Halo Keyboard, and we were “amazed” at how accurate the typing experience felt. Perhaps what will be more worrying to those in the doubting camp is what this might do to the price tag of the MacBook. Especially if you look at the inflationary effect the introduction of the Touch Bar had on Apple’s notebook range. Still, we shouldn’t get ahead of ourselves here, and the concept is definitely an interesting one if it does ever see the light of day.